John Perceval and The Angels. the cherubims shall stretch forth their wings on high, covering the mercy seat with their wings, and their faces shall look one to another; toward the mercy seat shall the faces of the cherubims be. The angelic society scripturally denoted as the ‘heavenly host’ is a hierarchical affair encompassing nine orders of being: Seraphim, Cherubim, Thrones, Dominions, Virtues, Powers, Archangels, Principalities and Angels. Angelology, the theological study of angels, tells us little about the inner lives of these spirits though we discover throughout the Testaments and also through countless pictorial examples what the general angelic functions might be. Seraphim and Cherubim are at the top of the apex, praising god and attending the heavenly throne while further down are those angelic beings that engage in the affairs of humanity. Lower still, in the ranks of the fallen, (Lucifer is included here), are such malcontents as the Nephilim, begotten of angels and humans and for the most part seen to be running amok. It is a dazzling if somewhat confusing collection of beings and generally, save for the occasional ‘walk-on’ part, angels are relegated to the margins. In view of the particularities of this ordering it hardly seems surprising that artistic responses to angels have tended to focus on their status as peripheral actors and attendants and only occasionally as beings that ‘come into their own’. Though the exceptions here have been those archangelic figures like Gabriel (appearing to the Virgin Mary) and Michael (conquering Satan), there is little if any serialised accounting of angels in all their manifestations. Angels more often than not are defined by their specific functions and less so by their individual identity. Looking back on this long tradition of depiction, preceded for millennia by the winged Victories of antiquity and latterly sublimated by the super-heroes of the American comic book genre, it is noteworthy indeed when angels are properly honoured as central actors and players. Perceval was not immune to these familial influences though neither, as a man of ‘earthy’ and irreverent temperament was he wholly swayed by religious zeal. Rather, Perceval saw from the outset how angels could embody the terrestrial and the heavenly, the ridiculous and the sublime, great suffering and also joy. Between 1957 and 1962 John Perceval produced an extraordinary series of ceramic sculpted figures encompassing angels, cherubim, infants, adults and animals. Inspiration came from the people and things around him: his four angel-haired children, the paintings of his closest peers and readings from the sacred scriptures. Viewed collectively Perceval’s angels, resplendent in their burgundy and emerald glazes, represent a remarkable body of work that must be rated as one of the significant serialised groupings within the epoch of Australian Modernism. The angels were Perceval’s only sculptural project, which despite attracting far less critical attention than his paintings were prized by the artist above any of his achievements2. They are significant also when compared with other serialised groupings produced by the artist’s closest peers. Arthur Boyd is well known for his Love, Marriage and Death of a Half-Caste Bride grouping, dating from 1951; Sidney Nolan is known internationally for his Ned Kelly series of 1946-47, and Albert Tucker produced Images of Modern Evil between 1943-48. The four men were friends and in each of the series mentioned we see an intermingling of social, political and personal concerns. In contrast Perceval’s ceramic angels are decidedly more whimsical in sentiment and in this they stand apart as a series. They are discernible also from Perceval’s more pointedly socio-political compositions from the 1940s. In Survival, 1942, for instance a mother is depicted vainly attempting to feed her emaciated child. It is a profoundly haunting painting and a harrowing summation of urban Australian poverty during the Second World War. By 1957 however, as the angels absorbed Perceval as a project, the zeitgeist of the previous war-afflicted decade had all but evaporated. 1956 saw the staging of the Olympics in Melbourne and the new medium of television was launched across Australia. The nation was entering an exciting period of prosperity yet one that was overshadowed by cold-war anxieties. Nolan and Tucker had both decamped to Europe and Boyd would move there shortly. Perceval, now married with children was making a stab at family life but with alcoholism and recurrent mental health issues already taking a hold, the scenario would not end well. It is from this period that the angels emerge: autobiographical reflections and also spontaneous contemplations of Perceval’s own children’s formative years. They speak of innocence and companionship and also of wildness and neglect; they run the emotional gamut from darkest pathos to rollicking bathos; they are playful in the full sense of the word but their amniotic glazes point to more potent natural forces. That the majority of the sculptures possess some of the finest copper lustre colouration ever fashioned by an Australian ceramic artist merely adds to their dramatic impact and their undeniable status as objects of immense visual poetry. The idea of the ‘delinquent angel’, whilst important to Perceval was not invented by him; nor was it entirely new in Australian art. In 1915, the Sydney based publishers Angus & Robertson released the popular ‘verse novel’ Songs of a Sentimental Bloke, by C. J. Denis. The work was illustrated by artist Hal Gye, who embellished it with images of ‘larrikin cherubs’. Some 66,000 copies sold and the ‘Sentimental Bloke’ became entrenched within the Australian imagination. It is difficult to dismiss Gye’s images as a possible precursor for Perceval for they featured so prominently during the period of the artist’s youth. A drawing like Gye’s The Stoush ‘O Day, 1915, can easily be compared with Perceval’s Fighting Angels, 1959. Nonetheless, the differences between the two are striking. Gye’s cherubs are disarming, while Perceval’s angels are often times disturbing; the former were light-hearted vignettes, the latter an exploration of the psyche. But if Perceval had access to this popular work, we could not but see it as a stark contrast to the realities of his young existence. A haunting early painting by John Perceval, Recollection of the Artist as a Small Boy Riding a Goat, 1942-43 (Art Gallery of South Australia) provides a window, if not into the actualities of Perceval’s young life, then how he experienced it to be. The painting is less an evocation of carefree youthful adventures but rather an occasion more disturbing. The goat upon which the child rides is devilish, the boy himself distracted, the composition oddly off centre; I would not want to be him. In another painting, Boy with Cat 2, 1943 (National Gallery of Australia), a child is clawed across the face by the feral beast he clasps in his arms. Both images reflect what Perceval described as a childhood marked by neglect, dislocation and illness. Perceval’s biographical details have been recounted elsewhere3 and these include his contraction of poliomyelitis, the breakdown of his parent’s marriage and the sadistic acts of his father. His early paintings are reflective of these experiences and the subsequent angel sculptures are also suggestive. In terms of artistic influences, especially in the case of the angels, Perceval spoke of his perusal of European religious art in the Public Library of Victoria where he discovered the work of French court painter Jean Fouquet (1425-1480).4 Fouquet’s Melun Diptych, c.1452, was of particular interest to Perceval for it featured six shiny red cherubs attending the enthroned Madonna and child. By contemporary standards these are weird little homunculi, roundly swollen like over-inflated dolls. The central figures are no less stylised and the effect is strangely surreal. Maybe that was what Perceval found appealing; not those endearing little ‘putto’ one sees in the Sistine Chapel by Raphael but spirits gone awry, their red bodies more suggestive of scarlet fever than of rude infantile health. According to Perceval’s daughter Celia, the first of the angels, a depiction of a baby, was made at the Boyd property at Murrumbeena in 1957 5, but the majority of the sculptures were created in Canterbury, in the artist’s studio home at 38 Wentworth Avenue. Period photographs show the artist surrounded by his creations. Sitting on a low step Perceval looks pleased with his sculpted and two-dimensional figures, which fill multiple sheets of paper and also line the shelves along the wall. The image was taken when a large number of the figures had been completed but the process of creation had many complex stages. In fashioning the heads and torsos of the angels, Perceval alternated between using a potter’s wheel and sculpting in the round. As early as 1958 we see the inclusion of sculpted musical instruments, which required elaborate forms of modelling and as late as 1961 the conical body form of the wheelthrownangels, which was much easier to fashion, is still employed. If anything the alternation between methods reflects the fact that Perceval continued to produce wheel-thrown vessels throughout this period, the angels evolving alongside and indeed as an extension of his wider practice. In period photographic prints showing Perceval working in the studio it is possible to see the wooden armatures used to support the as yet unfired angel figures. The circumstance in which they were produced is quite rudimentary, the entire project being completed with few implements and tools. In one instance Perceval can be seen modelling with the blunt end of a paintbrush and only a sponge to smooth the contours of the forms. In another photograph, in which Perceval and his three daughters view the unfired sculpture The Acrobat, 1958, (purchased that year by the Art Gallery of New South Wales), it can be seen how the piece was balanced atop three small balls of clay, which were subsequently removed before firing. Perceval is shown adding a lock of hair to the work, which in turn appears to reach up to the artist’s lips. The hair, according to his then wife Mary, was spun by the artist like fine Chinese noodles. 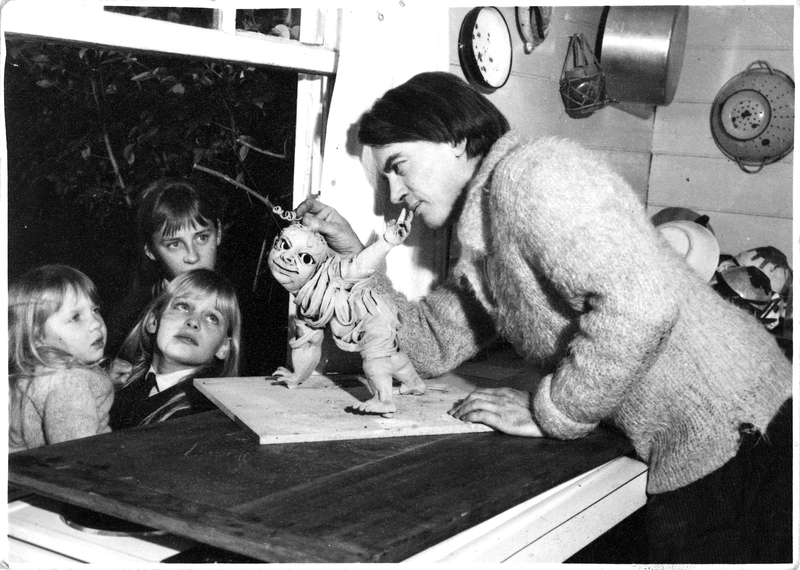 The model for this work, Perceval’s second oldest daughter Celia (known by the nickname Winkie) is in the middle of the group nursing her younger sister Alice, with oldest sister Tessa in the background. The Angels have always been of great interest to me. In fact, they aren’t of the sang-de-boeuf glaze lineage. The Chinese glazes are reduced fired at a high temperature around 1300ºc, where the Angels’ copper reds are a low temperature reduced copper lustre glaze. Reduction is where the kiln is starved of oxygen and that is why they have iridescence in certain light. The copper has been in parts reduced to a red but areas of metal copper can be glimpsed in natural light. They have small amounts of copper, usually less than 0.5%. John’s copper glazes have 2-3% in an earthenware glaze, fired to around 1080ºC. The Chinese glazes are reduced on the way up, the Angels’ copper glaze reduced at the finish of the firing. I heard a story that he introduced camphor balls into an electric kiln to cause the reduction. By the early 1960s Perceval’s career in Australia was beginning to take shape. Writing to the Melbourne-based art historian Bernard Smith, an important early champion of Perceval’s, the artist outlined a few of the highs and lows of life in the fast lane. Dear Bernard, Thank you for your nice letter. And I am so sorry I didn’t answer sooner. I have been in a really awful rush. We have been doing up our house to go to NY with Angels and whilst that the house caught on fire but was saved and we had a blow out in the VW and went over 6 times and also I was arranging an Ex with MOMA of angels I cancelled from but who has paid no accounts – (but has since paid up) and its going well, top price so far 500 gui. I’ve got yours in but not for sale. And meantime the Monash University has given me a job to do a ceramic mural (bas-relief without any pre-sketches – precedent) so we won’t be off to NY before about Oct-Nov 62 or August at soonest. The film of my things11 is now finished and you will soon get a print, My Dear Ambassador. And Lagalliene’s music, they tell me (I haven’t heard it) is beaut. About the Gallery, it sounds very good but do you think that I can plan ahead on the program I have set before me? Reed’s description indulges a playful interpretation of Perceval’s sculptures, but a more serious consideration was to occur shortly thereafter. Not long after the MOMA exhibition nine of the ‘Angels’ were included in the controversial ‘Antipodeans’ exhibition (4-15 August 1959), an event that also launched the ‘Antipodean Manifesto’. The two-page document was authored by Smith, though the signatories included the exhibiting artists: Charles Blackman, Arthur Boyd, David Boyd, John Brack, Bob Dickerson, Clifton Pugh and John Perceval. The stance of the group was in opposition to painterly abstraction, their cause the visual language of the artist. “Art is, for the artist, his speech, his way of communication. And the image, the recognisable shape, the meaningful symbol, is the basic unit of his language.”15 Like Perceval, the two Boyds and Blackman had produced serialised bodies of works. It served to convey their position as painters capable of sustaining continuous narratives throughout sequential compositions. Each work added something to the whole; these were artists that had something to say and their message was a complex blend of social politics and poetry. Theoretical posturing or the repetition of formalised visual devices could not contain their messages and the viewer was invited to explore their mythic languages. David Boyd exhibited paintings addressing the decimation of the Aboriginal people of Tasmania, while Arthur Boyd presented works from his Love, Marriage and Death of a Half-Caste Bride series. Viewed in this context Perceval’s Angels became a key example of the group’s commitment to the visual language of the artist. Perceval’s suggestion that the work is optimistic is worth further analysis. The figure, the Sun Embryo, appears to represent an as yet unborn soul hovering in close proximity to the Milky Way, which is likewise represented by the faces of children clustered together. Anthropomorphic interpretation of the stars is an old idea, very old in fact as we see in countless ancient cultures and Perceval conveys the idea most poignantly. The little cluster of faces forms a sweeping arc almost like a smile. Regarding this work former Artistic Director of the Monash Museum of Art, Max Delany commented that “the Sun Embryo is protected by the glorious cage of his own rays, the peaceful and benign form of this sleeping baby/ angel is a counterpoint to the tragedy on the wall nearby. Like an unconscious seed, this work contains shadows and highlights, offering a mysterious body, containing a symbol of birth and renewal.”21 While we recognise the piece as a part of Perceval’s ceramic oeuvre, as recently as 2005 the mural was, on the occasion of it being cleaned and re-installed, perceived by some students at Monash University as being a mode of contemporary art described derisively as distasteful. Thinking it had something to do with the theme of abortion, a petition was raised to have the mural removed. If anything the incident served merely to highlight the visceral power of Perceval’s art and its unabated capacity to provoke emotional reaction. It remains on view in the library. Perceval travelled with his family to London in January 1963, taking a house at 3 Southwood Lawn Road, Highgate, near to the Boyds and Blackmans. Much of the time he would paint on Hampstead Heath, occasionally keeping warm in a sleeping bag whilst painting vistas of snow-covered fields. Mary Perceval had packed more than a dozen angels into suitcases and had secured an exhibition at Zwemmer Gallery for 1964 – ‘Two aspects of the work of John Perceval’. Perceval made two new angels in London, which were fired but not glazed.22 The paintings were well received, the ceramics less so. It was the first overseas outing for the angels so the response was no doubt disappointing. Perceval had been included in the landmark exhibition ’50 Australian Painters’ at the Whitechapel Gallery in 1961; however critical attention turned favourably towards the new American painting, which was also headlining there. Gallery director Bryan Robertson had organised both national surveys but at the last minute the lion’s share of the endeavour centred on the Americans. Perceval attended the exhibition ‘Robert Rauschenberg, paintings, drawings, and combines, 1949-1964’, which took place in February-March 1964 at the Whitechapel Gallery. As his wife Mary described it, Perceval’s response was far from favourable. How naïve the ‘Antipodean Manifesto’ must have seemed in light of the triumph of this new and unbridled aesthetic. Perceval, somewhat piqued, returned home to create his own ‘assemblages’, nailing random household items to the wall; it did not translate into a change in artistic direction. Still in London, Perceval was awarded the inaugural Australian National University Creative Arts Fellowship, which enabled him to live and work in Canberra throughout 1965. A major part of his fellowship was a large retrospective exhibition held at the Albert Hall, Canberra, from July 13-24, 1966. The angels, which were included in the exhibition, were well received and sales made. Perceval was soon commissioned by the artistic couple George and Mirka Mora to produce six angels for the walls of their ‘Balzac Restaurant’ in Melbourne. Perceval’s angels had reminded Mirka of medieval sculpted ‘putti’ in churches in her native France and she too was a painter of angels. Perceval was delighted with the commission and added an extra work ‘for free’.23 Eventually the suite was sold to the art dealer Kim Bonython and tragically they were almost entirely destroyed in the Ash Wednesday bush fires in 1983. The remaining wall-mounted angel is now in the collection of the Queensland Art Gallery. The positioning of this group of angels in the bohemian Balzac Restaurant is reflective of the social milieu in which the pieces were created, the petit bohemia of 1950s Melbourne. As expressive forms, the angels progress from relatively benign portrayals of infants to far more complex works of art; this is especially apparent as Perceval elaborates their construction. For example, some pieces are little more than bottle-shaped bodies capped by spherical heads. In contrast, Delinquent Angel, 1961, in the collection of the Shepparton Art Museum, while sharing the unelaborated typology is decidedly more animated. The face conveys annoyance, confrontation and chagrin, the body is tense and the hands are defiantly expressive. But Delinquent Angel also supposes some questions: against whom or what is the angel protesting and why is it considered delinquent? There is no definitive answer but the scenario feels familiar. God, life or parents are the obvious targets here; but someone is calling the shots for otherwise the angel would not attract the aberrant title. There is also the bellybutton, which like many of the angels appears unusually large and expressive; more akin to a third eye than a navel. In a similar example, Listening Angel, c1957, the navel is a dense and enticing swirl. We notice it even before the upturned head of the figure, which is a comparable anatomical distortion. Of all the angel series, Angel Standing on Her Head is by far the most sexually potent figure. It is of a young woman or adolescent standing, in the manner of a gymnast, on her head. She is naked and her breasts dangle down to her chin. It is a delightful moment of uninhibited exhibitionism; legs wide apart and a tangle of pubic hair thrust skywards. The glaze in this instance is milky white rather than red, and it runs most sensually across the inner thighs of the figure. Associations between angels and sexuality turn our thoughts to that marvellous Renaissance creation St Teresa in Ecstasy, (sometimes known as the Transverberation of St Teresa) 1647-52, by Lorenzo Bernini. The arrow that penetrates the saint is delivered by a devilishly handsome angel and there is no ambiguity as to the nature of Teresa’s ecstasy. But where Bernini makes a link between matter and spirit, Perceval focuses on the flesh and it’s gravitational anchoring on the earth; this is Perceval the pagan. In Angel and Bull, 1958, we are presented with the curious coupling of a young woman and bull. It is likely an allusion to the ancient Greek story of Europa being abducted and ravished by the god Zeus who is acting in bovine guise, after which Europa gives birth to three sons. The face of Perceval’s Europa is not dissimilar to the subsequent depictions of ‘mother and child’ figures within the angel series. As night follows day the little baby angels, conceived in mythic circumstance, appear as flesh and blood creations and are let loose upon the earth. In Romulus and Remus with Wolf Mother, 1961, the two tiny foundlings suckle at the breasts of a she wolf. Traditionally this is the great symbol of the City of Rome, but for Perceval it is an evocation of the mythic abandonment of two siblings and their subsequent survival in nature. They are children born into the wilderness, both literally and metaphorically, and they appear on many occasions throughout the angel series. It is perhaps not too unreasonable to suggest that the paired angels / children / earth spirits are a coded allusion to Perceval and his sister during their childhood, though they are not always specifically gendered. In Fighting Angels, 1959, for instance the figures are of two boys wrestling. They are stood upright and locked in each other’s arms. There is little sense of aggression, just playful grappling, but the red glaze in this instance contrasts with a blackened clay base, which appears quite unpleasantly burnt. The violence is conveyed through this burning, an exterior force rather than between the figures, who are just simply playing. The two figures in Trevor and Friend, 1960, are noteworthy for there is no pretence that the individuals depicted are angels, but rather two rusticated youths. One is a singing madman, the other a premature curmudgeon. Like the physically challenged figures in Dwarf and Cripple (Department of Foreign Affairs and Trade, Washington). They are portraits of social outsiders, much like Perceval himself. At 67 centimetres in height The Kiss, c1960, is the largest work in the ‘Angel’ series, though strictly speaking this depiction of a couple entwined does not feature angelic beings at all. The relationship to the series is assumed by the fact that The Kiss shares the copper lustre glaze that unites the grouping overall. Thematically speaking they are the parents of the many infants and babies populating the suite, but as lovers they are ambiguous. The woman, with closed eyes appears lost in her pleasure but the man is indifferent or at best distracted. Both figures are bald, which sets them apart from many of the other figures in the series, which are crowned by splendid curly locks. This omission appears to amplify their nakedness and vulnerability; they are strange in a manner that recalls Jean Fouquet’s brittle figures. At the risk of over-interpretation however, The Kiss is perhaps the least resolved of the elaborate works in the series. The figures depicted are most certainly the symbolic parental reference, which is noteworthy, for Perceval at no point in the angel series makes allusion to godhead, thus reinforcing the earthy ambiance of the group. Viewed in its entirety, or more correctly its variety, Perceval’s angel’s series is not just a whimsical or decorative statement, it is a celebration of life’s grand themes – of existence as a fecund and sensual journey and yet an indictment of the world seems indifference even to innocent children. The examples of angels playing musical instruments are suggestive of creativity and artistry, the apex of what one might achieve, as indeed these figures are exemplary of the sculptor’s art. But this great celebration is overshadowed not merely by individual mortality, but by the total annihilation within the threat of nuclear war; that cloud of monumental terror so present in global consciousness during the 1950s and ‘60s. The series draws on an extraordinary array of influences, from pre-Christian mythology to the most recent scientific discoveries and also from moments of personal experience. Perceval manages to distill this information in a series that is deceptively amusing and subjective. Yet to study the angels is to be taken on a journey that is personal and universal, historically specific yet informed by art from across the ages. Perceval’s poetic language, his immense facility in fashioning clay and liquefied glaze into expressive and symbolic forms, his drawing out of personal feeling intermingled with a sharp visual perception all coalesce in the angels. As with his paintings, which have long attracted the strongest critical approval, their status as articulate and complex productions cannot be ignored? 2 I am grateful to Celia Perceval, the artist’s daughter for her comments pertaining to discussions with her father. 12 John Perceval, Melbourne 26 April 1962 to Bernard Smith. Correspondence held in the Bernard Smith archives, courtesy of Dr Sheridan Palmer, Melbourne. 20 Irving, P., op. cit. 22 in a 2004 conversation with the author, Mary Nolan described how Perceval created these angels. It is likely, based on the dates, that the sculpture Medusa, 1963 in the Collection of the National Gallery of Victoria is one such piece.